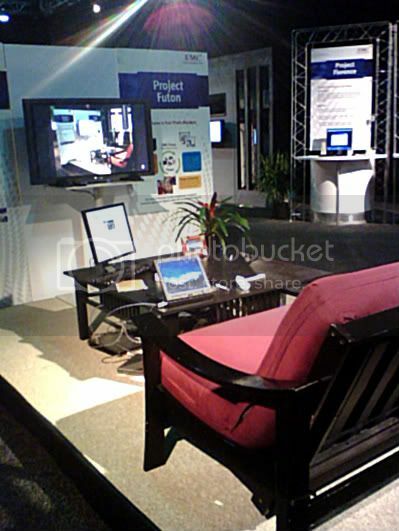 “Project Futon” demo area on the show floor at EMC World. EMC has made a habit of opening the kimono lately, especially at this year’s EMC World where execs divulged detailed roadmap information around backup and archiving software consolidation. They also had an exhibit set up as part of the show floor called the Innovation Showcase. The showcase displayed products on tap for much farther down the line, including Project Futon, a consumer appliance being developed at EMC’s R&D facilities in China to store digital photos. Eventually, the Futon software would automatically upload photos to the “Futon Cloud,” according to EMC senior engineer Hongbin Yin. Yin was one of several engineers on hand to demonstrate their prototypes. The goal would be to make small home appliances a “local cache” for multimedia, with long-term storage taking place in the cloud. Futon is also being developed to automatically collect metadata, including the location photos that were taken, and to integrate that information into other applications like Google Maps. Also on display was a diagram of “Centera with Data Lineage,” which, according to Burt Kaliski, senior director of EMC’s Innovation Network, would allow Centera to archive not just elements of a workflow but the workflow itself, and link documents to related data in spreadsheets and databases. Senior consulting software engineer Sorin Faibish was showing off his own diagram of “Application-Aware Intelligent Storage.” This would combine artificial intelligence software capable of being “trained” with hardware-embedded VMware ESX servers to automatically spawn services like data migration, encryption and replication to data as it comes into the cache on a storage array. The embedded ESX host would run EMC’s RecoverPoint CDP inside, logging and catalogging I/O, indexing data for input into a modeling engine, which would then decide on the proper way to store and protect the data before flushing it to disk.